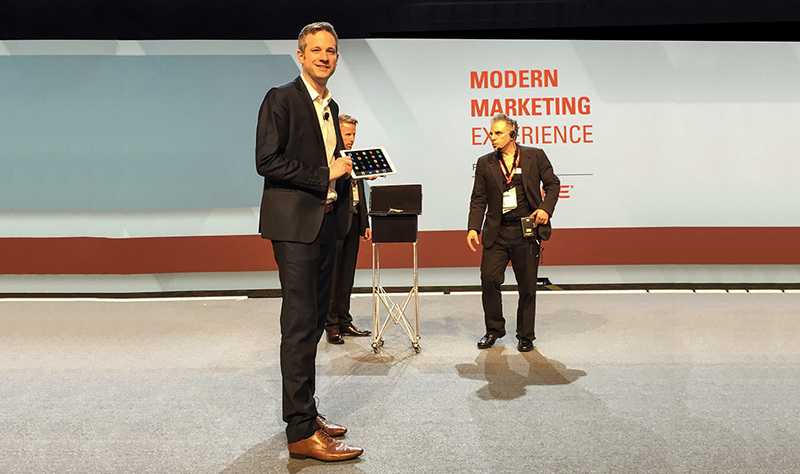 Take a look at this enormous 150-foot video screen that was my backdrop as I did my iPad magic act for Oracle Corporation. I’ve seen a lot of projector screens, but this one’s certainly the biggest! We worked our way through a busy day of preparation and rehearsals, and by late afternoon it was time for Oracle’s event to begin. 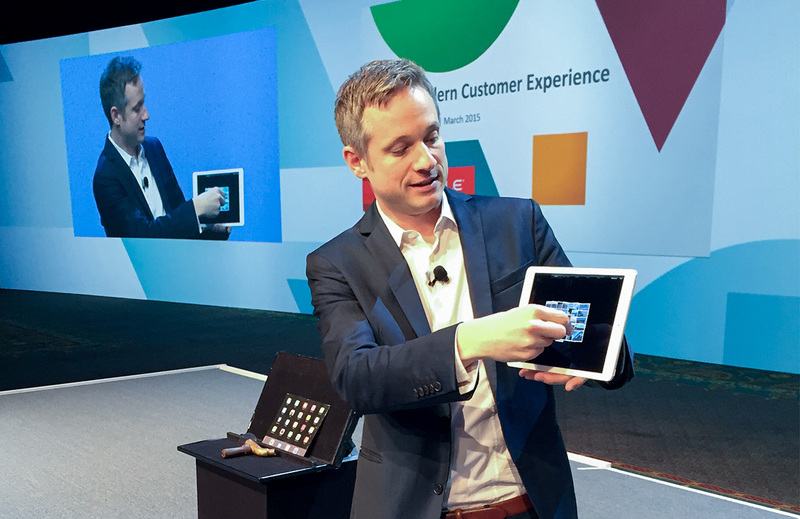 After a pair of fascinating speeches by Oracle CEO Mark Hurd and best-selling business author Daniel Pink, it was time for me to go on. 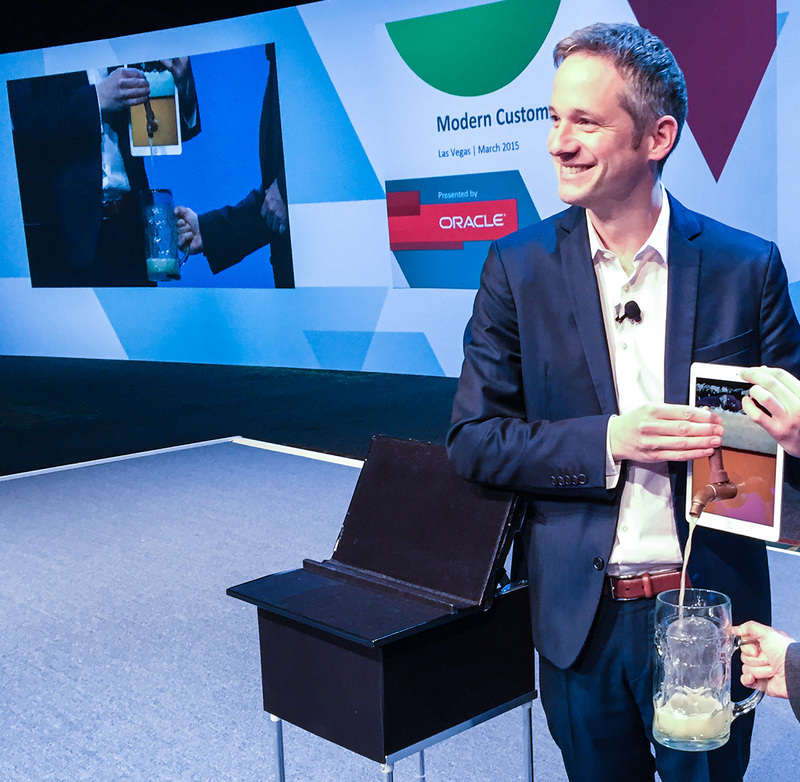 I had a great time on stage with Oracle Senior Vice President Joanne Olsen, as I poured her a giant mug of beer out of my iPad (here’s a shot of the beer trick at rehearsal). After the presentation, it was time for an equally big reception, where I was accompanied by six excellent magicians from Los Angeles as we all entertained a crowd of more than 1,000 people. It was spectacular. Magicians were all over the place, performing card tricks and illusions, with various objects floating through the air and flames coming out of peoples’ hands. It was certainly a stunning display of prestidigitation put on by an all-star group of magicians. My thanks to Oracle for inviting me, and to all of my magician colleagues for being so much fun to hang out with after the show!